INSIDE : No more fighting over unclear expectations. 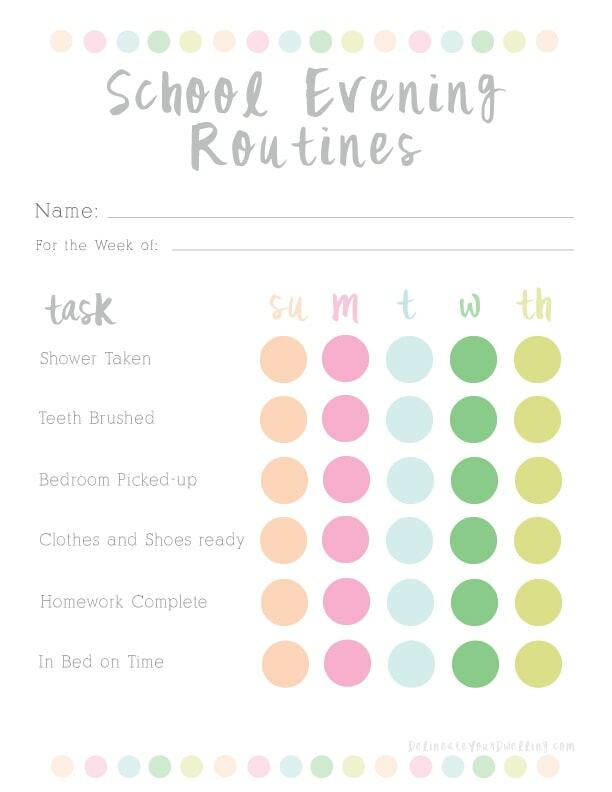 Help to streamline your days with this easy to use and pretty School Evening Routine Chart. Your children will love crossing off their tasks each night before they go to bed! School is back in session for most children at this point. My daughter (Kindergarten) has been in school for two weeks now and my son (Pre-school) starts this week. And let me say, as much as I craved a little order and schedule to our days… now that we are back to waking up early and getting ready quickly in the mornings, I am missing those carefree summer days! 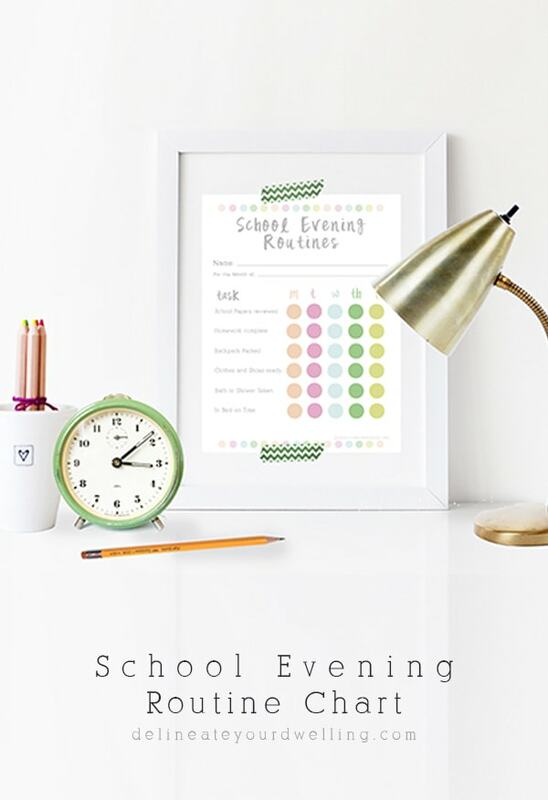 I decided it was time to streamline our school process all together and I created a School Evening Routine Chart for my kiddos (and me) to follow! HOW WILL AN EVENING ROUTINE CHART HELP? By using this colorful school chart, it will really help us to focus on what we need to prepare for the night BEFORE school instead of scrambling to do it all in the morning. I will readily admit, I love to sleep until the last moment -so having things in order the night before is so essential for me and for the sanity of us all. I have created this routine chart for a week at a time following a Monday through Friday school week. You can fill out your child’s name and the corresponding month at the top of the chart. I then have included six of the most essential tasks that we have to prepare for in the morning. There is enough room at the bottom of the chart if you need to add in any additional tasks that help your family run more smoothly. I also like the colorful dots for each day of the week, as my kids LOVE to cross out and check off any and all things. This chart is also available in a black and white version, if you would prefer to print it that way. AN UPDATED VERSION OF THIS CHART HAS BEEN ADDED. My kids are now in 1st grade and Kindergarten, so the tasks have been updated accordingly. Sign up for the DYD Insider newsletter to receive access to my ENTIRE DYD Printable Library along with this Chore chart printable!!! I hope this helps you to get a few more minutes of sleep in the morning because it sure has helped us!! So cute! My youngest started preschool this week too. Exciting times! So amazing how quickly they grow up!! This is really adorable! I’m definitely sharing with my friends and family that have kids.